made with the same finest Elisen Lebkuchen cookie dough. 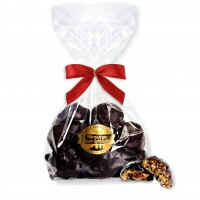 Just as delicious as its bigger brothers the Elisen Lebkuchen that are chocolate coated. Sugar, hazelnuts (core content 18%), hen's egg white , marzipan (sugar, almonds , chicken egg white powder), dry fruits (depending on flavour) approx. 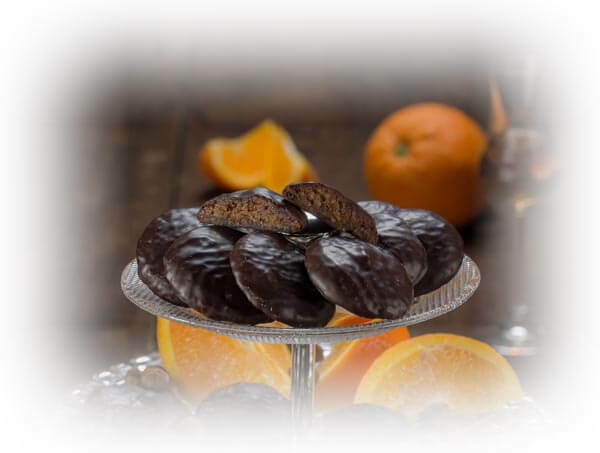 15%, candied orange peel (glucose-fructose syrup, orange peel, lemon peel, sucrose, acidulant: Citric acid, antioxidant: sulfur dioxide ), wheat flour , alcohol: rum, Williams, whiskey, gingerbread spice, honey, couverture (cocoa mass, sugar, cocoa butter, emulsifier: soya lecithin , vanilla flavor), raising agent: sodium bicarbonate, modified wheat starch , preservative: potassium sorbate.